This IBM Redbooks publication will help you to install, configure and exploit the latest security enhancements to the SecureWay Security Server for OS/390 and the IBM Communication Server. Using examples, we show you how to maximize the new Public Key Infrastructure enhancements that have been made to RACF, as well as exert more control over UNIX System Services superusers by using the new RACF security facilities. With Directory Services becoming ever more important in an e-business security infrastructure, we illustrate how to set up LDAP on OS/390. And as Virtual Private Network (VPN) becomes more accepted, OS/390 has a role in this area too. The new Internet Key Exchange (IKE) support will enable interoperability with other platforms, firewall, and VPN clients, and we describe how you can set up VPN support on OS/390. 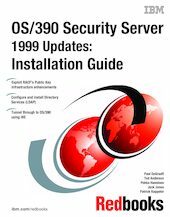 This book is the companion to OS/390 Security Server 1999 Updates: Technical Presentation Guide, SG24-5627.